The Mini Twist-On Ceiling Hanger - 8' Black Cord with Barbed End is a patented "all in one" solution for the hanging of light signs, banners and displays from a standard 1" ceiling grid. Each piece is made from durable polypropylene colored white. If attaching these cords is difficult for your organization, feel free to check out any of our selection of telescoping poles that each come with an attachment that will effortlessly mount your Mini Twist-On to the ceiling with its special mounting bracketry. 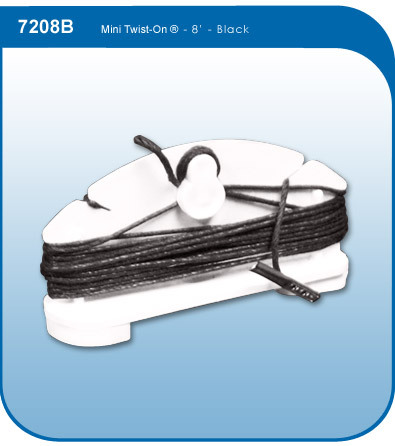 The Mini Twist-On Ceiling Hanger comes with an attached 8' barbed black cotton cord that can be unwound to any desired length from 3" to 8'.